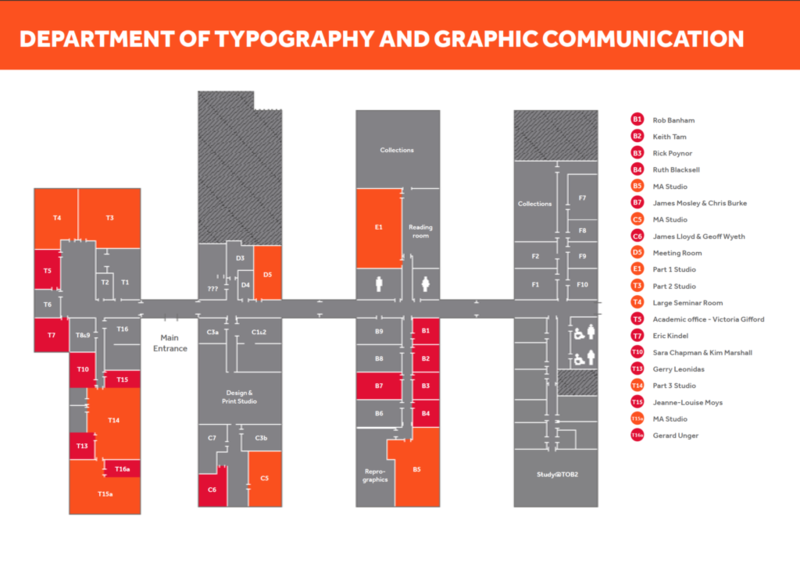 The department of Typography and Graphic Communication at the University of Reading have multiple different rooms that are needed to host different types of teaching. 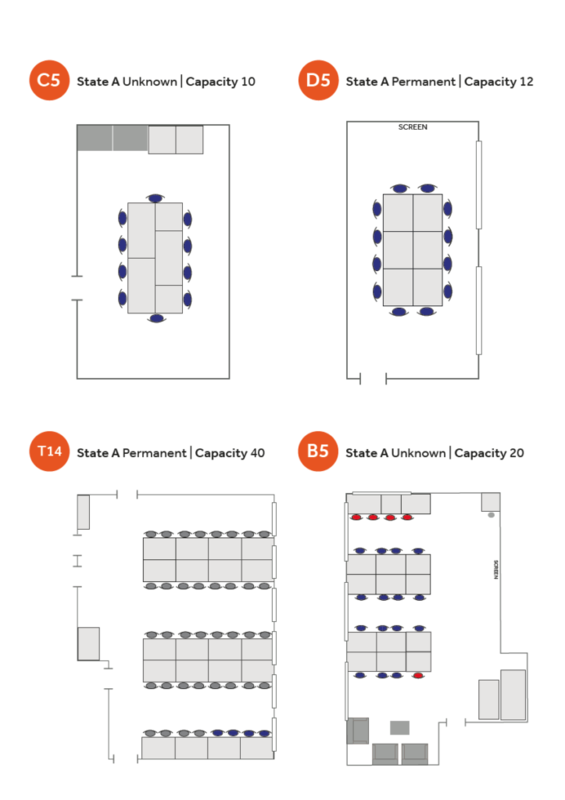 This means the furniture regularly has to be moved to ensure the teaching space is suitable. 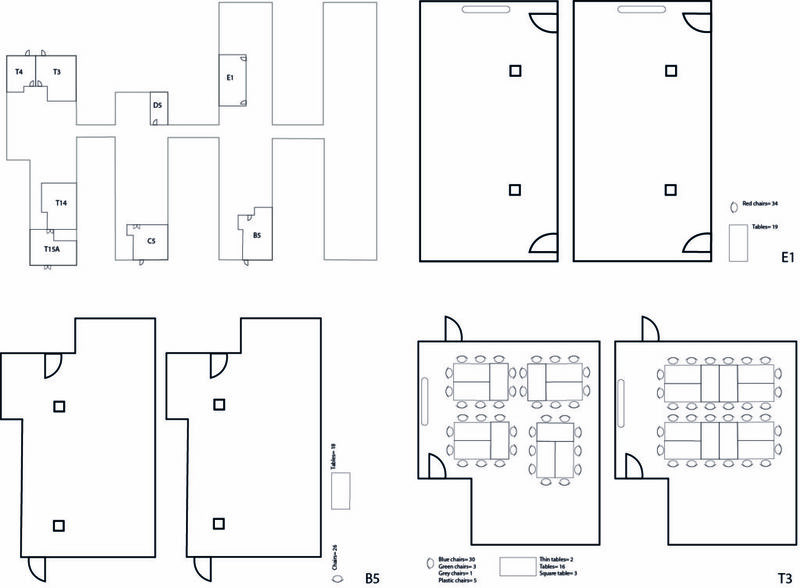 To make the process of moving the furniture easier and quicker, a set of room plans were requested to be designed and displayed in each room. University porters could then be brought in to move the furniture rather than students and lecturers doing it. 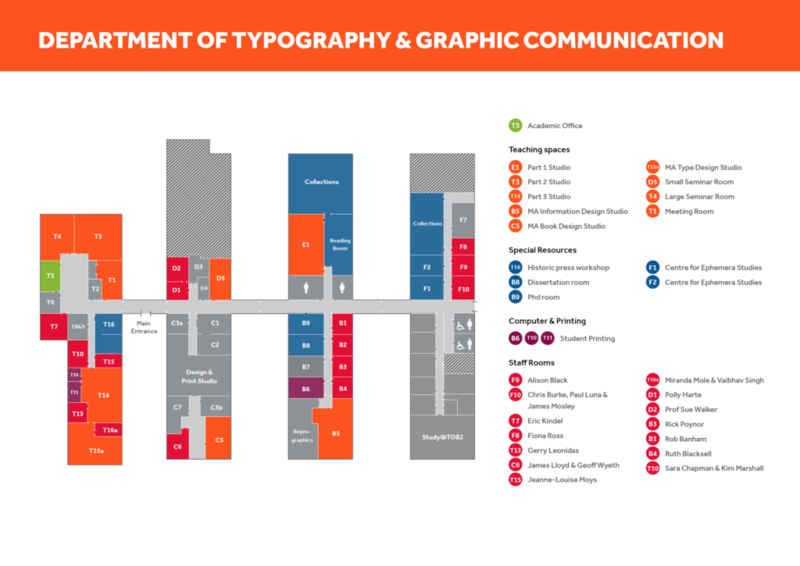 The brief was to make the layout of each teaching room within the typography department easy to set up in different states depending on the use the room is needed for. The room plans will be used by lecturers (both visiting and internal), students and university porters. The final deliverable is a clickable pdf that will be saved to the department sever and can be seen by all staff and sent out to visiting lecturers. 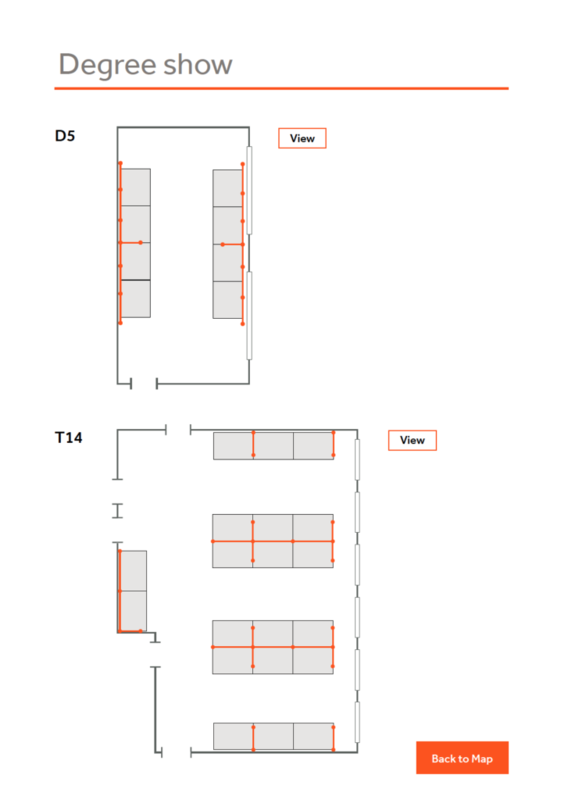 The pdf of the room layouts will also be printed and displayed in each corresponding room. In the brief we stated, the success of this project would be measured by the ease of use for both the lecturers and porters. As this project developed we discovered the ease of use was not just important for using the physical final deliverable to set up a room, it was also crucial that the files were all set up correctly and were understandable to ensure the room layouts can easily be edited and added to once the real job had finished. Although the porters have not yet tested the layouts for ease, we tested a member of staff within the department, Victoria Gifford, who will eventually come into contact with the porters directly about the room plans. Victoria found the files easy to navigate digitally and the files were easy for her to download and forward. On screen, she also understood what the elements within the room plans were showing. Throughout the design process, we had regular meetings with our client as we saw him during the real jobs meetings. This allowed us not only to keep the client up to date but to receive consistent feedback on our designs from him, the building manager and other students. This process allowed our work to evolve into a usable system for all people who would eventually come into contact with it. The original deadline was not met because when the deadline was approaching, the client added on the task of doing room plans for the degree show. Therefore, the deadline was extended until after the degree show to allow us time to see the setup of it. The revised deadline was never finalised between us and the client. As well as this, we feel the deadline may have been missed because there was too much of a casual relationship between us and the client due to the client being one of our lecturers. For the majority, this did not impact the work negatively as we were getting much more regular contact and feedback from the client. However, it meant there was not a strict deadline to meet. We have learnt that we should have pushed for a deadline to be set that was realistic for us so we had something to work towards and so it would have felt like a project that would happen in the workplace. Each teaching room has one main member of staff that we consulted about the room layouts. Through the process we continually asked them about suggested layouts for their room and we eventually gained sign off from each of them. The building manager, Geoff Wyeth then signed off each room from a health and safety perspective. Before we could begin design work, there was a lot of data collection to complete. 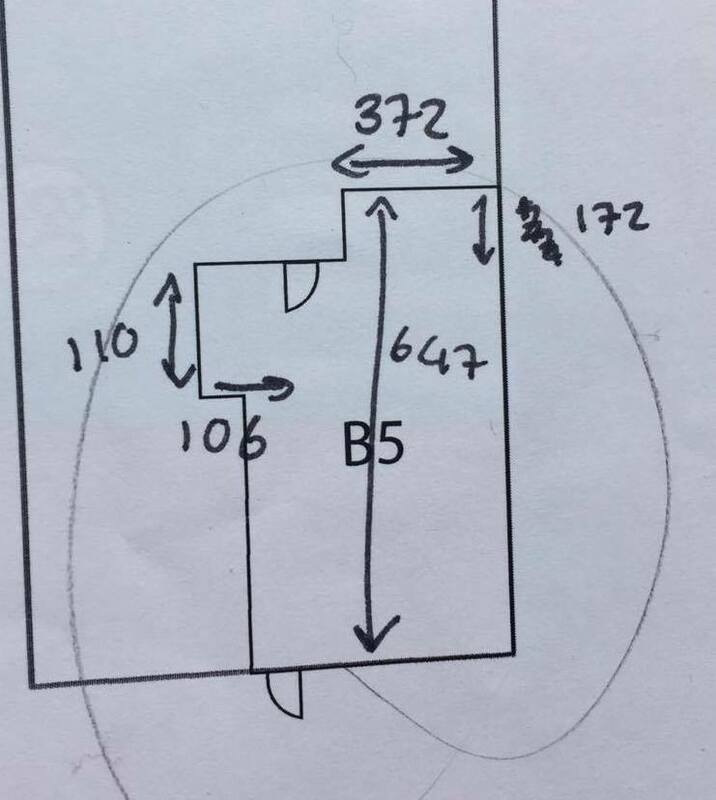 All eight teaching rooms that we were creating room plans for had to be measured. As well as this, all the tables had to be measured and the tables and chairs had to be counted. This was a time-consuming process as the tables and chairs were regularly moving around between the rooms. We then spoke to the lecturers to understand how many students would need to fit in each room when different types of teaching were happening. This was an important part of the process as it allowed us to understand the lecturers’ needs when teaching. During the process, we also spoke to our peers to see if there were any room layouts that would particularly help them with their learning. This was interesting as it showed us an audience we had not originally thought of as they would not use the room plans directly, but it would affect them. We quickly realised the artwork we were creating required mathematical thought as the furniture had to be to scale within the room as otherwise, it would be difficult to replicate the design layout in real life. The colour scheme for the designs was left up to us as designers, as it did not necessarily have to follow the University of Reading’s brand guidelines, however after discussing with the client, it was decided that using the department colour, orange, as the principal colour would match other printed documents within the department. We used the orange to highlight the teaching rooms to represent the department and the red to represent the University of Reading as a whole for the lectures rooms. However, this map looked too confusing with its similar colours. We introduced the University of Reading’s bright secondary colours to be used to highlight the importance of specific rooms on the department map. 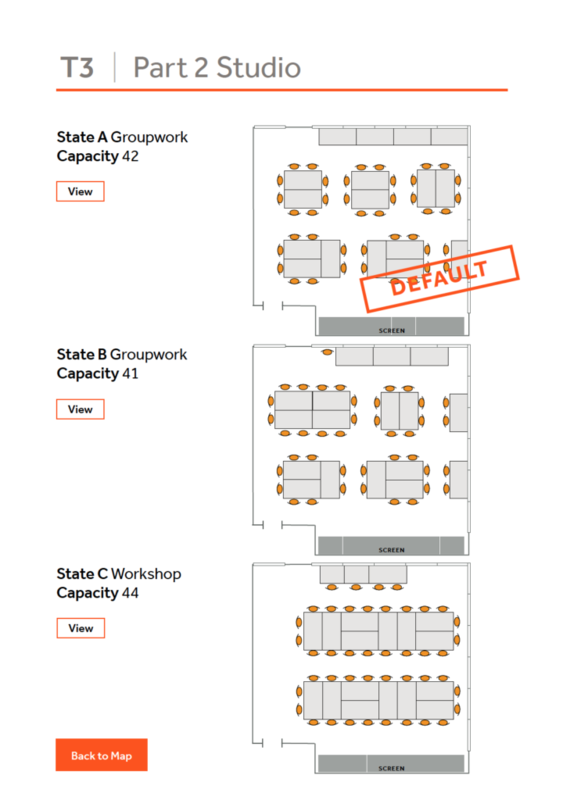 Although we came to a clear, accessible design for the room plans reasonably quickly, the file organisation and making that easy to use needed some adjustments. This taught us to do a thorough job when setting up and working on complex files in future projects. When our client set out the layout for the degree show, he said ‘the files seem easy to update increasing the chances that we maintain the system for the years ahead’. One of the main design deliverables was an interactive pdf for both the degree and all normal room states. This included a map of the department that allows users to click on the room they wanted to be taken directly, to see its states. This feature allowed the interactive pdf to be easily used by anyone and helped to quickly direct people through the volume of states. Creating this document was new to both of us and the skills we learnt while making it have been able to inform our work in other modules. This feedback proves that the room plans are effective, useful and easy to use. it has shown that we have achieved the aims listed in our brief. We hope that the files we have created can and will be used by the department in the future. Overall creating the various different documents has taught us not only about the importance of file management throughout a long and lengthy project as this one but also has increased the level of knowledge of the programs we have used. This real job has been invaluable in teaching us the importance of being up to date and making our files right the first time so that the project can progress quickly and efficiently.